- Pedicure & Manicure spa workstation. - Lockable & Rolling Trolley. - All Professional Salons & spas Need. Leveraging on our vast industry experience, we are providing a high quality range of Salon Spa Trolley. Wooden Melemine Polished Trolley and Safety Locked Lock Wheel. We are an unparalleled name in offering a premium quality Salon Trolley. Our offered products are designed by our highly skilled professionals using supreme class raw material as per the technological advancements. Tarang Wooden Spa Trolley is the most common & popular spa trolley. Due to its compact size and three levels of storage makes it best choice for any spa that has limited space for their spa area. It is made with hardwood and decorative veneer. Strong in design, it comes fitted with castor wheels for easy mobility. 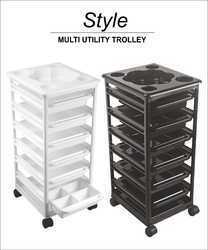 We offer high quality salon and spa Drawer Trolleys. Clients can avail from us quality Beauty Salon Trolley (Matrix 2 Side Close). These developed products is in total sync with the current style and fashion statements of our clients. Our team develops these keeping in mind exact requirements of the clients and defined parameters of the industry.